At 11pm on Saturday night, the dog ate my earplugs. Not any old earplugs (those ten-for-a-quid foamy ones that you have to twist into an impossibly tight roll to be able to get into your ear canal or the waxy numbers that you melt and shape with your fingers): no, these were my Alpine Sleepsoft thermoshaping earplugs designed for side-sleepers. And not cheap – a tenner a pop! I actually find it quite difficult to sleep without my earplugs. They’re a sort of comfort blanket fo my hearing. Most of the time I don’t even put them in, I just like to know that they’re there. I’m a very intolerant sleeper – the most minute noise in the bedroom sends me into a frenzy because I worry that it won’t just be a one-off. Is that an errant snort or the start of a snoring session? Did the dog in the distance send out a singular howl to wish its fellow neighbourhood dogs a good night or was it the beginnings of an hour-long barking opera, involving all aforementioned neighbourhood dogs? I digress. The dog ate my earplugs at 11pm and I ordered a new pair on my Amazon app at 11.30pm. It takes me approximately seventeen seconds to order something on Amazon because I have that one-click thing turned on, so by 11.30pm-and-a-half, I had an email in my inbox confirming my order. Do you know what time my earplugs arrived? At 9.30am THE FOLLOWING MORNING! Before I’d even had a shower, brushed my teeth, picked up the papers or let the dog out for his morning poo. Now (I hope you’re not eating) let’s just consider something for a second: the dog ate my earplugs at 11pm, they travelled through my dog’s digestive system overnight and were, no doubt, sat waiting to be expelled at the business end of his colon at around 10am. Amazon Prime, my dear friends, managed to deliver my earplugs faster than my dog can poo. If Amazon would like to adopt this as their slogan, I’ll allow it for a small commission. I can see it now, emblazoned across their homepage on one of those big banners. There could be a whole campaign based on things that your dog has eaten – the TV remote, Grandad’s socks, your new flip-flops – and the fact that Amazon can deliver them back to you faster than they are able to move through the canine digestive tract. Obviously there have been times that things haven’t arrived faster than my dog’s gastric juices can do their work – this ten hour turnaround seems to be an almost standalone case – but let’s not allow that small detail to ruin what could be my debut entrance into the world of advertising. Anyway, enough of arses, back to ears. 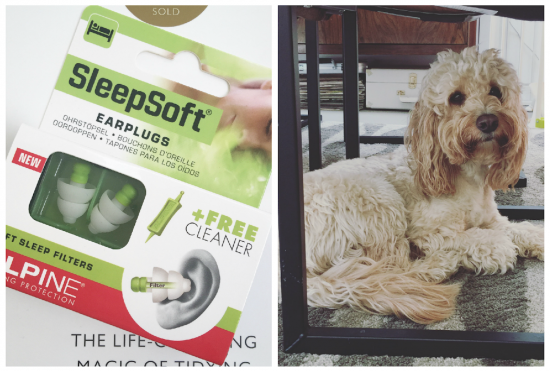 I’ve banged on about those Alpine earplugs loads before – they’re not ideal for everyone, because they’re not total noise-blockers, but for general annoyances that stop you sleeping then they are brilliant. So soft, easy to put in and pull out (they just have a little rubbery stalk thing) and ridiculously comfy to wear. Find them here – they cost £10.99. Previous Post Sunday Tittle Tattle: We Were On A (Mini) Break!